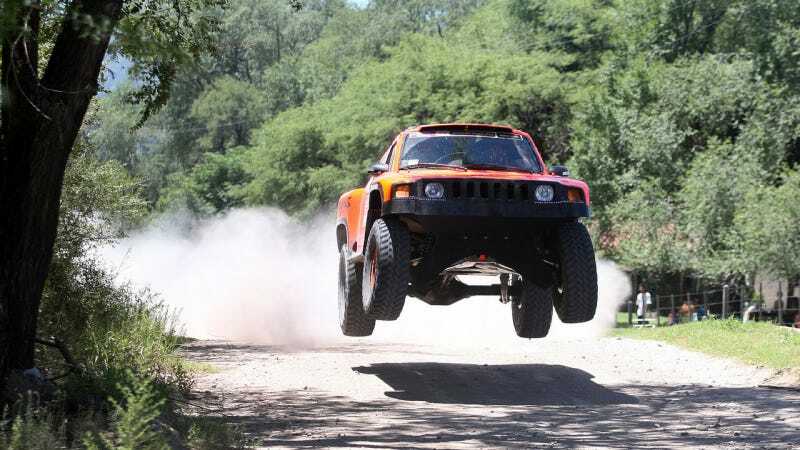 Despite getting in few flying photo-ops, Robby Gordon's new much-anticipated "HST Gordini" stuck Robby and Team Speed Energy with a disappointing start to his 2014 Dakar attempt. "I don't know what happened. Everything went smoothly when we took things easy on the link section, but from the moment we started the special, we had vapor lock problems and we had to stop. Then, all the other fluids started to overheat, so we had to stop at least five or six times... At the end, we had stopped for the umpteenth time when competitor No. 390 offered to tow us to the end of the special. Honestly, it's strange; I don't know why this happened. We'll have a look at it in the bivouac, although it's disappointing to lose two or three hours on the very first day of racing." At the end of Stage 1 he was in 133rd, more than two hours behind the leader as reported in Dusty Ventures' Daily Dakar. At 365 kilometers Stage 2 is just over twice as long as Stage 1, which will give Gordon a good opportunity to start making up time. It's obviously a tough place for him to be starting the race from, but this early in the Dakar there's still so much that could happen to anyone in the field. Of course, that's why we watch.